Does canning sound like a lot of work? But you like the idea of it? Until last summer, I had watched my grandma and mom can and freeze but I had never done it myself. I was inspired by my blog friends, Amy of a Latte’ with Ott, A and Jen of Mess Hall to Bistro. I decided having canned items in the dead of winter would be worth learning to can to feed my family. Learning tips from my mom and Grandma Nola, I tackled peaches last summer. I learned to pickle as well. My hands on help walking me through step by step has been my mother-in-law, Carol. A few weeks ago, Carol and I canned cherries together in her kitchen. 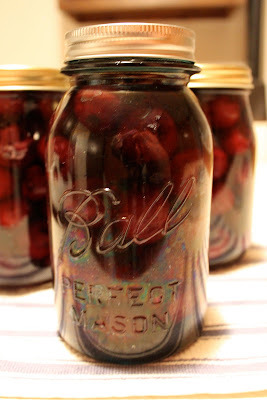 Cherries are my favorite fruit and having these jars will be divine on a North Dakota winter day. My mother-in-law has never had a kitchen mishap in the time I’ve known her. I have plenty so when she showed me her tried and true cookbook notes from years ago on canning cherries, I followed. For 7 quarts of cherries, you’ll need 9 cups of water and 6 cups of sugar. We removed stems, washed and pitted the cherries with a cherry pitting gadget of Carol’s and started with jars that had just been washed and dried. 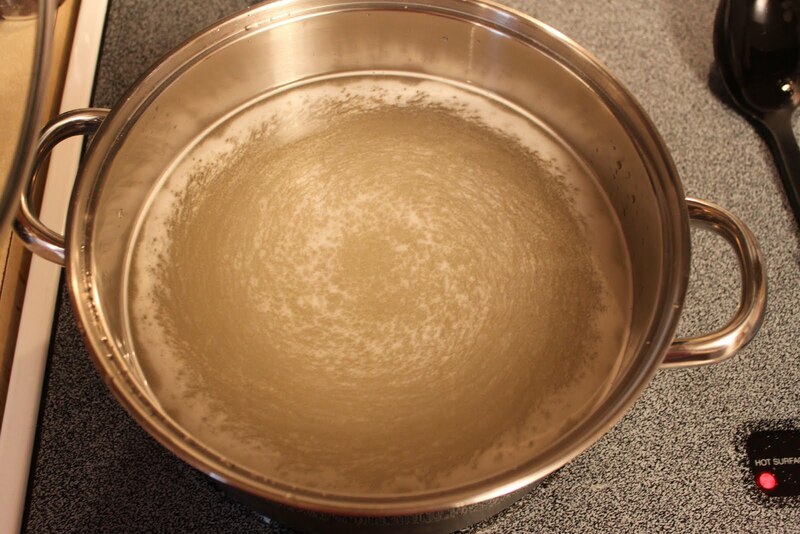 In a saucepan, I stirred the sugar and water together and turned to medium high to boil. We filled the jars with pitted cherries. 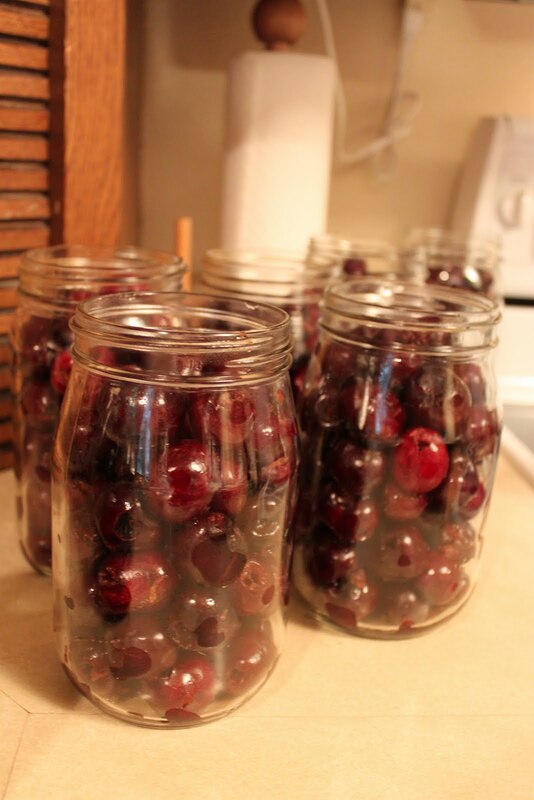 Pound each jar down on your fist once or twice and you’ll be able to fit in a few more cherries into each jar. This was an old trick Carol’s late mother taught her. Once the water and sugar solution comes to a rolling boil, you have the syrup to pour over the cherries. Make sure you have lids and bands for your jars. Heat the lids while your syrup is coming to a boil. Fill each jar with the syrup to cover the cherries. Just as expected, Carol’s recipe turned out just right and we had enough syrup for all cherry jars. Fill your canning boiler with water and have that coming to a boil as you place the lids and bands on each jar. Fill the jars into your rack and place carefully into the boiling water. Cover and boil for 20 minutes. If you live at higher elevations, follow this table for times. While I waited I hung out in Carol’s canning kitchen in her basement which is full of treasures like the Kelvinator refrigerator. I wish I had an antique working fridge. Another treasure Carol dug out was this “antique” lunch box, once used daily by my husband. Adorable. The 20 minutes flew by while I antique hunted. I removed the rack from the canning boiler and set out to cool. All the lids had sealed and we cooled them until the next day. The cherries now sit in our pantry and I’m saving them until a cold winter day to enjoy a slice of summer. My garden is late this year but I hope to make and can salsa this weekend with garden tomatoes and jalapenos. What do you think? Are you going to try your hand at canning? Or do you already? What are favorite items or recipes you can? I’m linking up for…and need your vote. Please “Like” #41 on this canning linky list. The entry with the most “likes” wins. One thing to know about me…I like to win. Thanks in advance. I love cherries! My aunt in Oregon cans a lot, so each year, we do a swap. I send her tomatoes and she sends me cherries! I have never had canned cherries (except dessert cherries). . . how to they compare to fresh cherries? Great post. I’m going to try this recipe later, this weekend. Thanks! Those jars of cherries are beautiful. So glad you are learning to can from family; as I think it’s a great tradition to hand down and hope your girls will learn it someday as well. 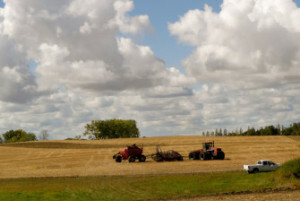 And thanks a Latte’ for linking up to our Canning Week Blog Party. I love the post! I have a very similiar fridge to Carol’s antique. I love mine! And I remember Nathan and that lunchbox from school!